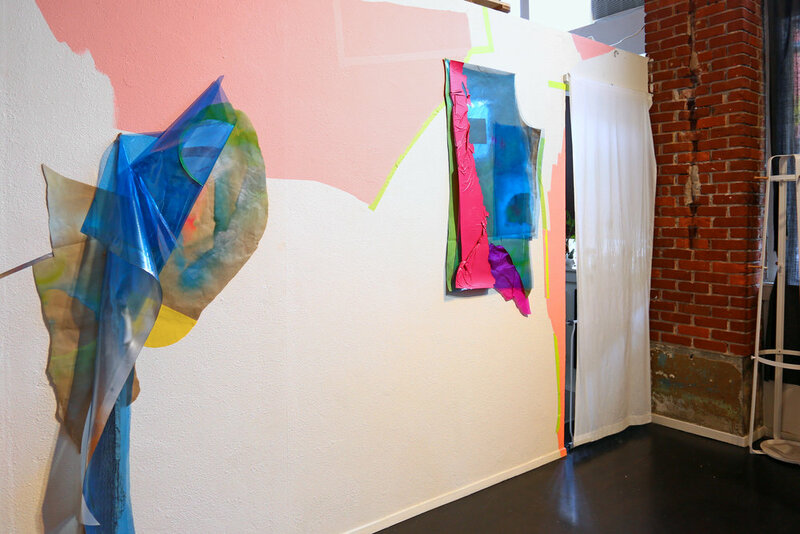 In partnership with Portland ‘Pataphysical Society, S/PLI/T is proud to announce INTER/MISSION, a two person exhibition with installation work from Los Angeles based artist Allison Peck, and digital media from Washington D.C.-based artist Rives Wiley. Rives Wiley makes videos of figures positioned in elaborate built environments that blend the real, surreal,and virtual. Their behaviors walk an uncomfortable line between restraint and repetitive action that recalls the pull and push of social conventions on ourselves. Allison Peck intervenes in individual sites, adeptly using languages of material, shape, and color to break down any pretense of a gallery as place-less, as a way to explore notions of space and our positions within it. For this exhibition she will install site-specific work in conversation with the space, the curators, and fellow artist Wiley. Both Wiley and Peck work with ideas of environment: Wiley creates fictive environments to mirror the influence of our own social and virtual settings, while Peck forces us to confront the immediate environment of the gallery space. Each artist points to our agency, or lack thereof, in the ever present context of our surroundings.